FuSt 360: 10 Most Amazing Extinct Animals. 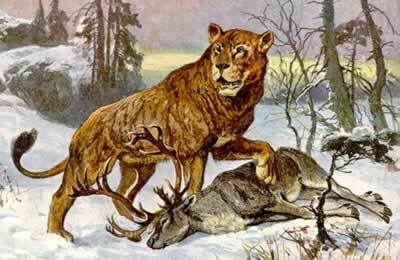 10 Most Amazing Extinct Animals. 1:Tyrannosaurus Rex (extinct 65 million years ago)[ Wiki]. Tyrannosaurus rex was one of the largest land carnivores of all time, measuring up to 43.3 feet long, and 16.6 ft tall, with an estimated mass that goes up to 7 tons. 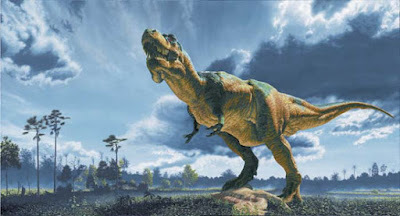 Like other tyrannosaurids, Tyrannosaurus was a bipedal carnivore with a massive skull balanced by a long, heavy tail. Relative to the large and powerful hindlimbs, Tyrannosaurus forelimbs were small and they retained only two digits. Fossils of T. rex have been found in North American rock formations dating to the last three million years of the Cretaceous Period at the end of the Maastrichtian stage, approximately 68.5 to 65.5 million years ago; it was among the last dinosaurs to exist prior to the Cretaceous-Tertiary extinction event. More than 30 specimens of T. Rex have been identified, some of which are nearly complete skeletons. Some researchers have discovered soft tissue as well. The abundance of fossil material has allowed significant researchhistory and biomechanics. into many aspects of its biology, including life history and biomechanics. One of Africa's most famous extinct animals, the quagga was a subspecies of the plains zebra, which was once found in great numbers in South Africa's Cape Province and the southern part of the Orange Free State. It was distinguished from other zebras by having the usual vivid marks on the front part of the body only. In the mid-section, the stripes faded and the dark, inter-stripe spaces became wider, and the hindquarters were a plain brown. The name comes from a Khoikhoi word for zebra and is onomatopoeic, being said to resemble the quagga's call. The quagga was originally classified as an individual species, Equus quagga, in 1788. Over the next fifty years or so, many other zebras were described by naturalists and explorers. Because of the great variation in coat patterns (no two zebras are alike), taxonomists were left with a great number of described "species", and no easy way to tell which of these were true species, which were subspecies, and which were simply natural variants. Long before this confusion was sorted out, the quagga had been hunted to extinction for meat, hides, and to preserve feed for domesticated stock. 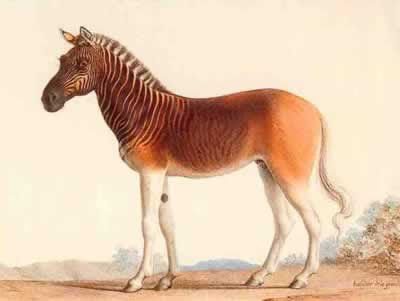 The last wild quagga was probably shot in the late 1870s, and the last specimen in captivity died on August 12, 1883 at the Artis Magistra zoo in Amsterdam. Because of the great confusion between different zebra species, particularly among the general public, the quagga had become extinct before it was realized that it appeared to be a separate species. The quagga was the first extinct creature to have its DNA studied. Recent geneticresearch at the Smithsonian Institution has demonstrated that the quagga was in fact not a separate species at all, but diverged from the extremely variable plains zebra. 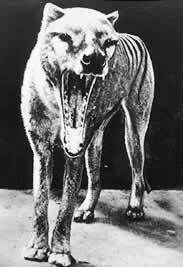 The Thylacine was the largest known carnivorous marsupial of modern times. Native to Australia and New Guinea, it is thought to have become extinct in the 20th century. It is commonly known as the Tasmanian Tiger (due to its striped back), and also known as the Tasmanian Wolf, and colloquially the Tassie (or Tazzy) Tiger or simply the Tiger. It was the last extant member of its genus, Thylacinus, although a number of related species have been found in the fossil record dating back to the early Miocene. The Thylacine became extinct on the Australian mainland thousands of years before European settlement of the continent, but survived on the island of Tasmania along with a number of other endemic species such as the Tasmanian Devil. Intensive hunting encouraged by bounties is generally blamed for its extinction, but other contributory factors may have been disease, the introduction of dogs, and human encroachment into its habitat. Despite being officiallyclassified as extinct, sightings are still reported. Formerly found near the Asiatic coast of the Bering Sea, it was discovered in in 1741 by the naturalist Georg Steller, who was traveling with the explorer Vitus Bering. The sea cow grew up to 7.9 meters (25.9 ft) long and weighed up to three tons, much larger than the manatee or dugong. It looked somewhat like a large seal, but had two stout forelimbs and a whale-like tail. 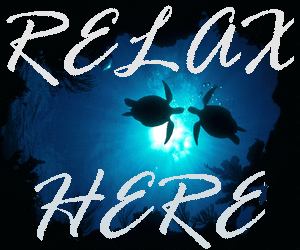 According to Steller, "The animal never comes out on shore, but always lives in the water. Its skin is black and thick, like the bark of an old oak..., its head in proportion to the body is small..., it has no teeth, but only two flat white bones—one above, the other below". It was completely tame, according to Steller. Fossils indicate that Steller's Sea Cow was formerly widespread along the North Pacific coast, reaching south to Japan and California. Given the rapidity with which its last population was eliminated, it is likely that the arrival of humans in the area was the cause of its extinction elsewhere as well. There are still sporadic reports of sea cow-like animals from the Bering area and Greenland, so it has been suggested that small populations of the animal may have survived to the present day. This remains so far unproven. The Irish Elk or Giant Deer, was the largest deer that ever lived. It lived in Eurasia, from Ireland to east of Lake Baikal, during the Late Pleistocene and early Holocene. The latest known remains of the species have been carbon dated to about 5,700 BC, or about 7,700 years ago. The Giant Deer is famous for its formidable size (about 2.1 meters or 7 feet tall at the shoulders), and in particular for having the largest antlers of any known cervid (a maximum of 3.65 meters/12 feet from tip to tip and weighing up to 90 pounds). Discussion of the cause of their extinction has still focused on the antlers (rather than on their overall body size), which may be due more to their impact on the observer than any actual property. 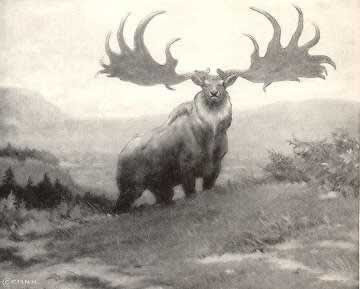 Some have suggested hunting by man was a contributing factor in the demise of the Irish Elk as it was with many prehistoric megafauna, even assuming that the large antler size restricted the movement of males through forested regions or that it was by some other means a "maladaptation". But evidence for overhunting is equivocal, and as a continental species, it would have co-evolved with humans throughout its existence and presumably have adapted to their presence. The Caspian tiger or Persian tiger was the westernmost subspecies of tiger, found in Iran, Iraq, Afghanistan, Turkey, Mongolia, Kazakhstan, Caucasus, Tajikistan, Turkmenistan and Uzbekistan until it apparently became extinct in the 1970s. Of all the tigers known to the world, the Caspian tiger was the third largest. The body of this subspecies was quite stocky and elongated with strong legs, big wide paws and unusually large claws. The ears were short and small, and gave the appearance of being without hair on the tips. Around the cheeks the Caspian tiger was generously furred and the rest of its fur was long and thick. The colouration resembled that of the Bengal tiger. Male Caspian tigers were very large and weighed 169-240 kg. Females were not as large, weighing 85-135 kg. There are still occasional claims of the Caspian tiger being sighted. 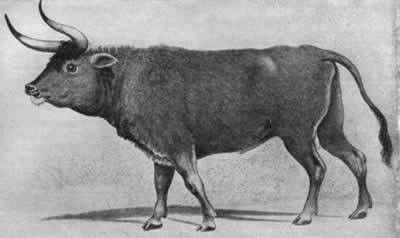 One of Europe's most famous extinct animals, the aurochs or urus (Bos primigenius) were a very large type of cattle. Aurochs evolved in India some two million years ago, migrated into the Middle East and further into Asia, and reached Europe about 250,000 years ago. By the 13th century A.D., the aurochs' range was restricted to Poland, Lithuania, Moldavia, Transylvania and East Prussia. The right to hunt large animals on any land was restricted to nobles and gradually to the royal household. As the population of aurochs declined, hunting ceased but the royal court still required gamekeepers to provide open fields for the aurochs to graze in. The gamekeepers were exempted from local taxes in exchange for their service and a decree made poaching an aurochs punishable by death. In 1564, the gamekeepers knew of only 38 animals, according to the royal survey. The last recorded live aurochs, a female, died in 1627 in the Jaktorów Forest, Poland. The skull was later taken by the Swedish Army and is now the property of Livrustkammaren in Stockholm. In the 1920s two German zookeepers, the brothers Heinz and Lutz Heck, attempted to breed the aurochs back into existence (see breeding back) from the domestic cattle that were their descendants. Their plan was based on the conception that a species is not extinct as long as all its genes are still present in a living population. The result is the breed called Heck Cattle, 'Recreated Aurochs', or 'Heck Aurochs', which bears an incomplete resemblance to what is known about the physiology of the wild aurochs . The Great Auk was the only species in the genus Pinguinus, flightless giant auks from the Atlantic, to survive until recent times, but is extinct today. It was also known as garefowl, or penguin. 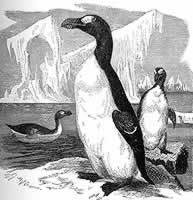 Standing about 75 centimetres or 30-34 inches high and weighing around 5 kg, the flightless Great Auk was the largest of the auks. It had white and glossy black feathers. In the past, the Great Auk was found in great numbers on islands off eastern Canada, Greenland, Iceland, Norway, Ireland and Great Britain, but it was eventually hunted to extinction. Remains found in Floridan middens suggest that at least occasionally, birds ventured that far south in winter as recently as in the 14th century. 9:Cave Lion: one of the largest lions ever (extinct 2,000 years ago) [Wiki]. The cave lion, also known as the European or Eurasian cave lion, is an extinct subspecies of lion known from fossils and a wide variety of prehistoric art. This subspecies was one of the largest lions. An adult male, which was found in 1985 near Siegsdorf (Germany), had a shoulder height of around 1.2 m and a length of 2.1 m without a tail, which is about the same size as a very big modern lion. This male was even exceeded by other specimens of this subspecies. Therefore this cat may have been around 5-10% bigger than modern lions. It apparently went extinct about 10,000 years ago, during the Würm glaciation, though there are some indications it may have existed as recently as 2,000 years ago, in the Balkans. 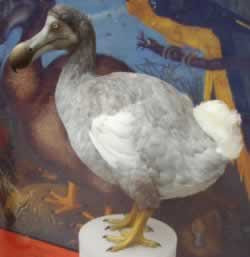 10:Dodo: the archetype of extinct species (extinct since late 17th century) [Wiki]. The Dodo (Raphus cucullatus) was a flightless bird that lived on the island of Mauritius. Related to pigeons and doves, it stood about a meter tall (three feet), lived on fruit and nested on the ground. The dodo has been extinct since the mid-to-late 17th century. It is commonly used as the archetype of an extinct species because its extinction occurred during recorded human history, and was directly attributable to human activity. The adjective phrase "as dead as a dodo" means undoubtedly and unquestionably dead. The verb phrase "to go the way of the dodo" means to become extinct or obsolete, to fall out of common usage or practice, or to become a thing of the past.